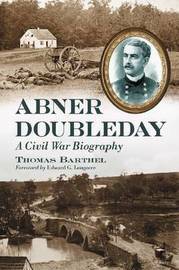 While Abner Doubleday is remembered primarily for his 'invention' of baseball, this biography focuses on his duty to his nation. Following Doubleday's youth in Auburn, NY, to his days as a cadet at West Point, the general's involvement in the American Civil War, and his public service afterwards, he is portrayed here as a man who took unpopular stands but was guided by a firm vision of justice. Thomas Barthel, a professor emeritus in the State University of New York system, has written seven books. He lives in Clinton, New York.